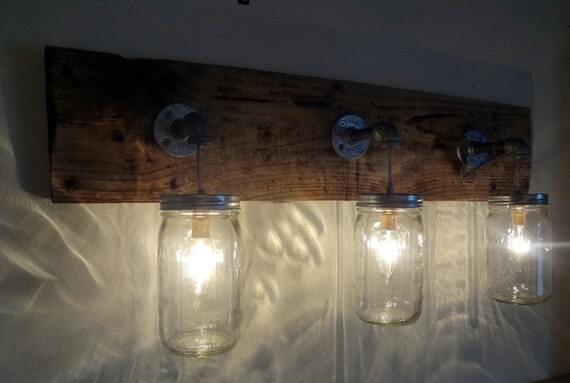 Primitive Rustic Shabby Chic Barn Wood Oak Mason Jar Hanging Light Fixture. Truly a OOAK piece here with this rustic vintage lamp. A couple vintage antique items have been combined to create this beautiful light. The reclaimed barn wood has become our base for the light. The old elbow pipes add a ton of character and the always lovable mason jars are perfect for the glass fixtures. This light is an example. Because they use 100 year old barnwood each lights wood will be a little different….